Most people aren’t very good at relaxing today. Waking hours are predominately hurried and noisy. We all yearn to relax and may talk about how we need to, yet we don’t really know how to. Too often we confuse it with vegging out in front of the TV or other mindless activities, only to be left wanting. Mindless is the key word above. True, healthful, restorative relaxation needs to be mindful, not mindless. Intentional, focused, and yet not strained or stressful. The are many different relaxation techniques promoted today. The common denominator of most is deep breathing. And although prestigious medical organizations such as Harvard Medical School have studied and documented the physical and emotional benefits over the last few decades, this is an ancient practice of many world cultures. Our lives are filled with situations daily that cause a stress reaction in varying degrees—the heart beats faster; breathing becomes shallower and more rapid; muscles tense up. These are the things we associate with the fight or flight response. You can’t stop stressors completely, but you can learn to counter them with relaxation techniques that lower heart and breathing rate, relax tense muscles, and diminish the flood of hormones released under stress that work against overall health. A few minutes of deep breathing a couple times a day provides a great decompressing, restful state. Find a quite place and sit in a comfortable upright position. Take a deeper breath—not by raising your shoulders and expanding your chest, but by expanding your belly. This isn’t natural for many because we’ve become overly self-conscious of an expanded belly! This is called diaphragmatic breathing. Inhale and exhale slowly and deeply. Breath in through your nose. Exhale through your nose or mouth, whichever you prefer. While you breathe, focus your thoughts on the air coming in and as it goes out. If you find your mind wandering, consciously refocus on your breathing. Do this 5-10 minutes once or twice a day. Set a timer at the beginning of your exercise so you’re not preoccupied with time. 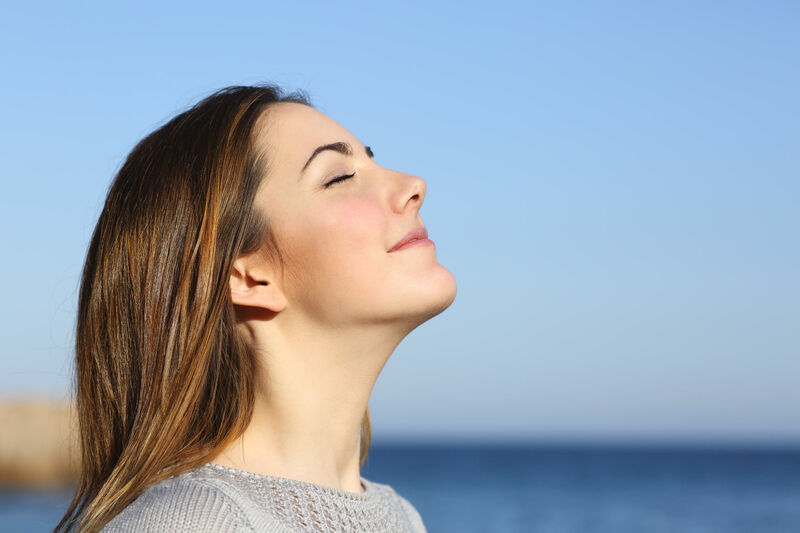 Variations of this simple deep breathing exercise include guided imagery, cultivating gratitude, and/or reflecting on God’s goodness. A couple other favorite apps I’ve used before the Apple Watch’s Breathe are Simply Being and Calm. Try this for yourself. Incorporate into your morning routine. Repeat later in the day before bed. Break away for a few moments during the day if you’re going through a particularly stressful time. Give it a test for a week or two because it takes a bit of practice and the benefits become better with repeated practice. Turn your normal involuntary breathing into a powerfully restorative decompression tool for greater peace and productivity. Question: What has been your experience with mindful deep breathing for relaxation? Share your answer in the comments below.